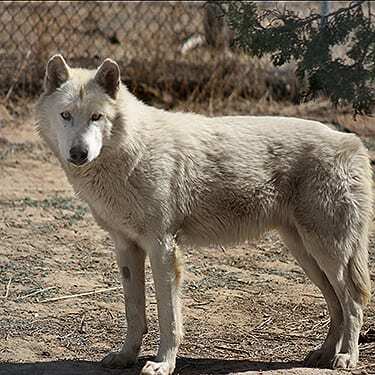 BIO ~ Bear is a neutered male high-content wolf-dog. We rescued him in April 2018 when he was 5 years old. PERSONALITY ~ Bear is very sweet and very loving. He trusts people after they prove themselves to be loving, patient and respectful. He is submissive and tucks his tail when he comes up to greet people he feels comfortable with. He will completely steal one’s heart. 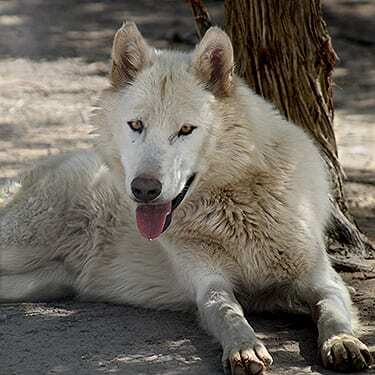 RELATIONSHIP ~ Bear lived with Westeros Pack rescue, Nymeria. She was very excited at first, but there seemed to be some nervous tension we were not comfortable with. They took a break for a short time, but their final months together were peaceful. 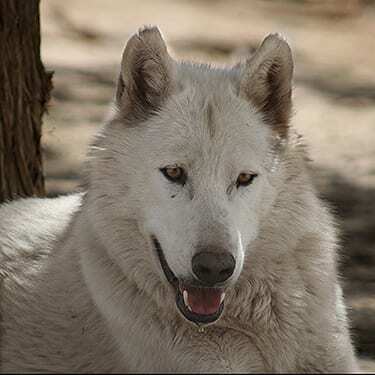 We helped Nymeria join the Big Pack in the Sky on March 17, 2019, due to cancer in her sinus cavity. LIKES ~ Bear loves giving hugs to our Assistant Director, Crystal. When he was first rescued, Crystal thought he was hugging her for security, but now, she feels his hugs are affectionate. He is loving enrichment walks, fully appreciating exploring and experiencing new things along the way. DISlIKES ~ Bear gets very nervous when men he doesn’t know well walk by his habitat, especially when it’s time for breakfast. He also disliked when Nymeria is eating and he’s not. FUN FACTS ~ Unlike most canines, Bear does not like peanut butter! Also, we shortened his original name, Walking Bear. WISH LIST ~ We were so proud of Bear who was very brave on his very first walk on a leash when we relocated him to another habitat. He did so well, that we thought he might be comfortable enough to go for enrichment walks. Now, he loves to go for walks. It’s always so much better for our rescues when we are able to leash and walk them in case of vet visits, or relocation. Bear would love some donations for a new heavy-duty leash and collar for many more adventures! Bear Would Love More Sponsors! BEAR’S HISTORY ~ Bear’s story is a very controversial one with many different versions, depending on who is telling the story. The one thing we know for certain is that Bear was bred in captivity to make money for his owner. He was born at a working animal fur farm/petting zoo, where the owner charged visitors different fees to interact with a large variety of wild animals. A DNA test revealed that her wolves were high-content wolf-dogs, which means they tested mostly wolf but had a bit of dog in their history. Some of the people who visited the farm gave it good reviews citing kind staff and well-cared for animals, while others gave it completely opposite reviews, citing small cages and horrible conditions. The owner faced controversy and court battles for many years. She was shut down at one time but re-opened in 2016. We were very excited to offer four of our single rescues the chance of making a new friend. We spend every day and many hours with our rescues and know their different personalities very well. That makes it easier to decide who to introduce to each other, but love is complicated, and rescues don’t always get along. 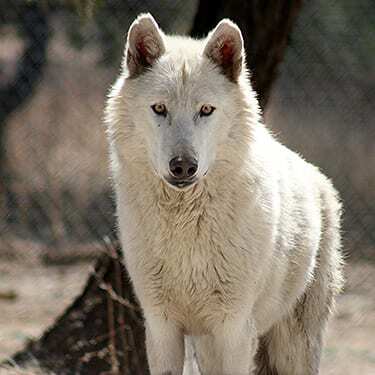 We introduced Bear to one of our single Westeros Pack girls, Nymeria. She was maybe a little too excited about her new friend at first, so we separated them for safety. After we reunited them, they had no major disagreements and stayed together until we helped Nymeria join the Big Pack in the Sky on March 17th, 2019.